Thank you, Mick, much appreciated! Keep up the blue side! Featuring Canon’s Channel map. 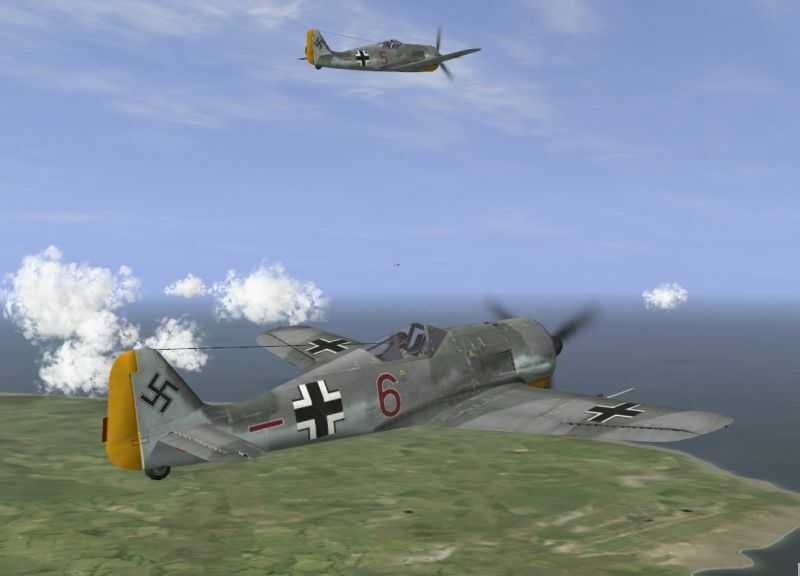 Added flyable Fw 190A-2. Sorry, I forgot to include upgrade for Mustang Mk.I (probably already installed by those who played previous version); please get it clicking HERE (if you need). Link for campaign download: same of first post. I'll play this great and interesting campaign asap! Your works are really welcomed and usefull! Too kind... Please, ask at will! Updated v2.1; added Spitfire Mk.Vb as flyable. Implemented German attack with torpedoes to ships. Small corrections to map environmental parameters are included. Same link of first post. I thought to add a German career to this campaign, picking the Jabo Staffel of JG26. "Fw 190A-2 did not have cooling louvers for its engine: these improvements were introduced with version A-3. I was unable to find a suited skin, so I slightly modified an existing one to fit. Luftwaffe emblems in game are often misplaced, oversized or not matching the real one; I tried to enhance historical accuracy removing them for JG26 (couldn’t find photographic evidence for Bf 109F-4/B and Fw 190A-2 based along the Channel at that time) and changing color and location for Bf 109F-4 belonging to II/JG1." On the other hand, are the limits dictated by the chosen map, where England is limited to one airport and the historical base of JG26 is not included. Hi GB I started your historical campaign Channel 1942 and reading your notes on the coolers of the fw190 A2 I do not agree with you. The A2 and A3 models were externally identical. The A1 model instead did not have the coolers. Complimenti per le tue campagne sempre ben riprodotte. Yes , same info source that I found.